If you’re a boomer traveler looking for adventures in the American Southwest, you’ve come to the right place. It’s a part of the United States that we love to explore, and know well. Come back often as we continue to add new southwestern U.S. travel adventures to this page. Or subscribe to the My Itchy Travel Feet Weekly Broadcast to be the first to know! Which states make up the American Southwest? Arizona and New Mexico are the heart of the region. But most experts also include Utah, Nevada, California, Colorado and parts of Texas. Those are the destinations that we’ll feature here. When should you visit the American Southwest? We recommend avoiding the hot summer temperatures in favor of spring or fall. Winter is also a fine time to explore, however higher elevations might have snow. Plus you’ll run into the winter snowbird crowds, especially in southern Arizona. How do you plan your American Southwest trips? When researching road trips, as well as off-road adventures, The Bench Press Road & Recreation Atlas is our go-to guide. You’ll find individual versions for all the western states. When it comes to hiking, we are big fans of Falcon Guide hiking books. Again, you can find versions by state, national park or even regions of the U.S.
And if you’re looking to visit a national park in the American Southwest, start your research at our national park adventures page. Road trippers will want to check out our US road trips page for more southwestern travel ideas. Now let’s get started on what you came here for—adventure! 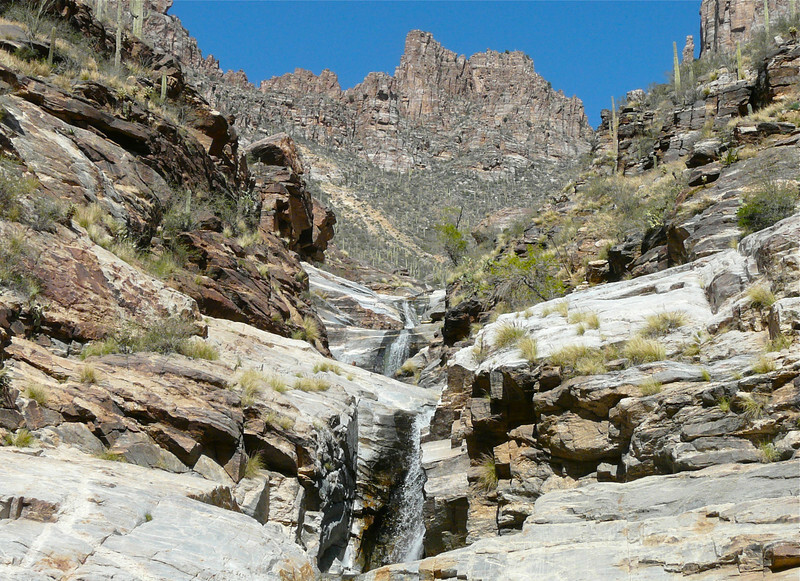 Southwestern hiking adventures are best when a waterfall is involved. From hiking to biking to bird watching to simply exploring, this region of the U.S. has it all. Active boomer travelers will find more than enough to do. We promise! After living in Tucson, Arizona, for eleven years, it’s safe to say that we know active travel in the Southwestern United States. We spent much of our time hiking, four-wheeling, road tripping and exploring, especially in Arizona, New Mexico and Utah. Get up off the couch and go with southwest travel adventures that boomers can do! The Monument Valley Scenic Drive is one of the most iconic experiences in the American Southwest. Follow our do-it-yourself-tour to discover the stops along the 17-mile Monument Valley Loop Drive as well as tips for more to do. The best places to stay are also included in our Monument Valley travel tips. 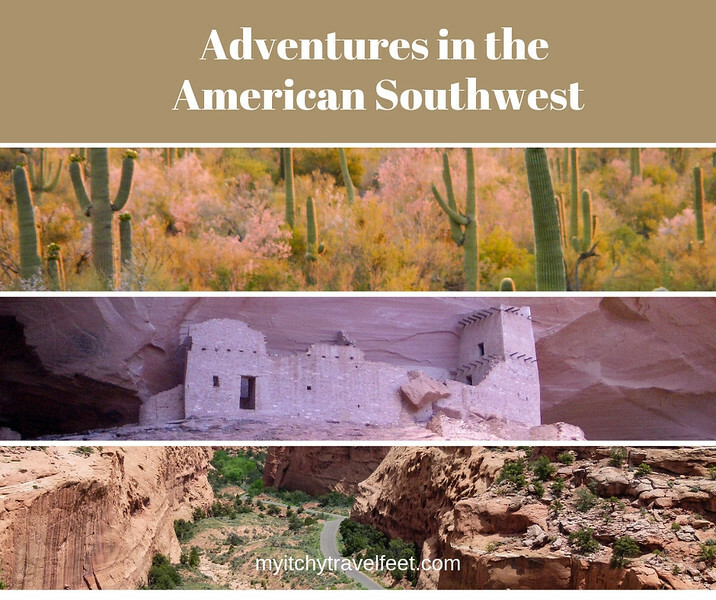 Visit Waterholes, Upper Antelope and Lower Antelope slot canyons near Page, Arizona, for a fun boomer travel adventure in the American Southwest. Be sure to bring your camera along to capture the beauty of these spectacular slot canyons. Discover one of the most remarkable and isolated sites in the American Southwest. White Pocket in the Vermillion Cliffs National Monument is a photographer and hiker's delight. Guest writer, Bill Haskamp, shares tips for getting there and what to do once you arrive. Looking to explore Tucson? How about a 36-hour active travel itinerary to make the most of your trip to one of Arizona's most popular destinations for boomer travelers. We lived in Tucson for eleven years so we know what we're writing about! Exploring the Navajo Reservation in northern Arizona is one of our favorite baby boomer travel adventures. We'll take you beyond Monument Valley on this road trip adventure in the American Southwest. From Canyon de Chelly to Navajo National Monument, you'll appreciate our travel tips. On a visit to Grand Staircase-Escalante National Monument, we experienced one of the best waterfall hikes in Utah. Our late spring hiking adventure included wildflowers and the reward of beautiful Lower Calf Creek Falls. We'll be hiking this moderately-easy trail again. We're huge fans of driving the country lanes and dirt roads of the American Southwest. On a visit to Grand Staircase-Escalante National Monument in southern Utah, we chose to take the Burr Trail. This mostly paved road travels through a scenic sandstone canyon. Check out our experience driving the Burr Trial Scenic Byway. As you can probably tell, Southern Utah is one of our favorite areas of the Southwest. Attending the Bluff Balloon Festival in January is a special treat, especially if you have the opportunity to fly in a hot air balloon like we did. Bonus points if it snows. Don't miss this unique experience in Bluff, Utah, one of our favorite Utah destinations. Looking for an off-the-beaten-path New Mexico backroads adventure? Travel between Tucson, Arizona, and Grants, New Mexico, on a weekend road trip to El Morro and El Malpais National Monuments. There's plenty to see along the way. Carlsbad Caverns and White Sands National Monument are two underrated experiences that should be included on any Southwestern road trip. Our tips will help you explore two of New Mexico's off-the-beaten-path treasures. You'll discover outstanding four-wheel-drive trails in the San Juan mountains near Ouray, Colorado. The ride to Yankee Boy Basin is one of our favorites. You'll think you took a wrong turn and arrived in the Swiss Alps. It's that beautiful! The Alamo has been around since the late 18th Century. It's an historical treasure and one of the nation’s most-visited attractions. However, there is so much more to see and do! Discover our tips for visiting San Antonio, Texas.